The most populous city in Canada, and the fourth most populous city in North America, Toronto is a thriving, multicultural metropolis. If you love a big city, but desire a little of the calm of Canada, consider moving to Toronto. Canada is welcoming more and more immigrants as part of a policy for economic growth. Many of Canada’s new arrivals head for Ontario. As the eastern most province’s capital, Toronto is located in Southern Ontario on the shore of massive Lake Ontario. Just a stone’s throw from rivers, ravines and forest, Toronto sits on a plateau that has been traversed by indigenous people for more than 10,000 years. Toronto has a population of nearly three million and is classed as one of the most cosmopolitan cities in the world. Almost half of Toronto’s residents belong to a minority population group. Over 200 ethnic groups make Toronto their home, speaking over 160 languages. You will find many thriving industries, including music, media, finance, tourism and technology. The headquarters of many Canadian and global organisations reside amongst Toronto’s skyscrapers. Despite having a big city skyline, Toronto is a clean and attractive city with many areas set aside for parkland and just a short journey to the true wilds of Canada. The city is visited by 25 million tourists each year. Toronto was home to the indigenous people of Canada for thousands of years. First were probably the Wyandot people, followed by the Iroquois. The first European trading posts in the area were setup by the French in 1750, later in the 18th Century the area was populated by the British. The next biggest influx of migrants were Irish after the Great Irish Famine and by 1851 the Irish-born population were the largest ethnic group. They were followed by migrants from many countries during and after the second world war, to make Toronto the truly multicultural city it is today. English is the most widely spoken language in Toronto, but Italian and Chinese are the next most popular languages spoken at work. Canada is officially bilingual in English and French but only around 10% of Ontario’s French speakers live in Toronto. Emergency services in Toronto are able to answer a call in 150 languages. Toronto slopes downwards from its northern point for 21km to Lake Ontario. It’s surrounded on all but the lake side by the Greater Toronto Area (GTA). Just to give some perspective, the city of Toronto covers just over 632 square kilometres, Lake Ontario covers nearly 19,000 square kilometres. To visit the ocean on the east coast you could take an 8 to 10-hour drive, a 3-hour flight into Maine or a 1.5-hour flight to New York. Toronto is classed as semi-continental (inland) and has four distinct seasons, plus some quite incredible variations in weather for North America due to the “lake effect” from Lake Ontario and the other neighbouring great lakes. Summer is sunny, warm and humid, winter is cold, though not as cold as many of Canada’s cities. There will be snow on the ground most days between mid-December and mid-March. Smog can be a minor problem in summer blowing in from factories and industrial plants on the shore of Lake Ontario, and from further afield in North America. Earthquakes are rare in Toronto but can happen. The strongest for Ontario was a 3.8 magnitude quake 18 years ago. The great lakes can cause fog and sometimes a delaying of spring, or autumn like conditions known as “seasonal lag”. Lake effect snow is the most severe effect of living close to such an expanse of water. Sudden blizzards or “white-outs” can be extremely hazardous for drivers, and lead to large volumes of snow which can bring the city to a halt for a few days at a time. Canada’s immigration policy is relatively open if you have skills to offer, can financially support yourself and have close family in the country. There are a number of immigration streams you can consider. Some are federal schemes which apply to the country as a whole, with no restrictions on where you live, unless you are tied to a job offer. Canadian provinces also have their own immigration streams some of which can be more faster or more favourable depending on your experience and the skills in demand in the province. If you are visiting Canada from the UK you can usually stay for under six months without needing a visa. Here is a quick summary of some of the immigration streams which could lead you to a permanent move to Toronto. As Toronto is in the province of Ontario you can also consider immigration routes through the Provincial Nomination scheme there. For Ontario it’s the Ontario Immigrant Nominee Program (OINP) which allows employers to sponsor applicants who have experience which is in demand for Ontario. Though not the place to start your immigration to Toronto the British Consulate-General in Toronto represents the UK government in Ontario. They provide certain services to British nationals living in or visiting Canada. They can help if your passport has been lost or stolen and with other notarial and documentary services. The Canadian Food Inspection Agency will require documents for an animal travelling to Canada, as long as it meets their import requirements. Dogs and cats coming from the UK, which is recognised as being a rabies free country, do not need to be quarantined. Be careful about certain breeds of dog as Pit Bull Terriers cannot be taken to Toronto or Ontario. Birds and rodents are also allowed but there are some restrictions depending on the species. Rabbits do require quarantine. There are direct flights available from the UK to Toronto. A Heathrow to Toronto flight is around 7 hours 45 minutes. It may be cheaper to consider a flight which changes at an airport in Europe such as France or Amsterdam which will add a few hours to your journey. Prices vary greatly so Google Flights is a good place to start your search and get an idea of prices. Flights will be more expensive at holiday times, such as school summer break and winter vacation. Though it’s far less popular, if you really don’t like to fly, or love the ocean, you can make your move to Toronto by sea. As well as cruise ships, jumping aboard a cargo ship is another possibility. They do accommodate passengers and your route would probably by Felixstowe to New York. This would leave you either an overland flight, bus, or car journey from New York to Toronto, but it would also be a great opportunity to explore. Making a move to a new city and new country is incredibly stressful. We are tied to both our family and friends and our material possessions and just don’t want to leave either. With modern technology, social media and falling communications prices it’s easy to keep in touch. But, what do you do about your belongings! We all accumulate many items which have personal attachments, from treasures and trinkets through to art and furniture. It’s actually less expensive than you think to move your belongings from one country to another and you probably want to consider using a moving or shipping company. Though you can arrange to pack, protect, and ship your belongings through a courier or arranging a container on freighter yourself. Using a professional shipping and moving company takes this stress away. They will work with you to plan the size of your shipment, whether you need a whole container or space in a shared container, inventory and insurance, and help with packing your possessions so that they arrive safely. A moving company will plan and execute every step of the journey from collecting your items to ensuring they arrive safely, right at the door of your new home. If you are shipping your possessions you must make sure they are wrapped safely and securely and protected from damp as they could be in transit for a while. If you are sending a shipment from the UK to Toronto it will take a few weeks to arrive by sea. You can ship your belongings ahead of time so they are waiting for you when you arrive. If you are going to be waiting for the rest of your items when you arrive in Toronto, it’s important to pack in your suitcases, which will travel with you by plane, everything you need. Take important documentation with you when you travel, ideally in your hand luggage. This should include things like birth certificates, passports, visa’s, marriage certificates and bank cards. All that said don’t give in to the temptation to overpack. Only pack what you can comfortably carry. You have a long journey and need to have a hand free to help you get your bearings when you arrive in Toronto! If your visa application requires it you will need to have a job before you make your move to Toronto. If not it’s still something you, or anyone accompanying you is likely to want to arrange before you move. Job bank is the government job board for Canada then there are many others like Indeed and Monster. Unemployment is low, around 6 per cent for Ontario, and has been since 2001, however there is still high demand for skills which are in short supply in Canada. Technology, media, culture and food businesses are thriving in Toronto which means many jobs are available. The official federal government jobs website is Job Bank. Any employer who is eligible to hire a foreign worker must have posted their jobs on Job Bank, so it’s a sensible first place to start. To work in Canada, you will need a Social Insurance Number (SIN) which you must apply for when you arrive at a Service Canada location. It’s a simple process if you have your work visa and there are 10+ Service Canada locations in Toronto alone. You will need your SIN number to access any government programs and benefits. Canadian schools have high academic standards and Toronto is no different. Every child in Canada has a legal right to education and there are no tuition costs for Grades 1-12. Excellent private schools are also available. There are a number of private international schools in Toronto which offer French, German, Canadian or International Baccalaureate curriculums and there is a boys only school. As an economic and cultural capital of Canada it’s no surprise that Toronto is home to some of Canada’s best universities. The University of Toronto is ranked 32nd in the world by QS World University Rankings and 1st in Canada. There is also York University, and Ryerson University. The province of Ontario has one of the best health care systems in the world. Once you have held Canadian residence for three months you can join the Ontario Health Insurance Plan (OHIP). You can apply as soon as you arrive in Canada. The OHIP pays for many of the health services you may need. You may also be able to get your OHIP if you have been working on Toronto, or Ontario, for six months or are waiting to get permanent residence. Toronto is the hub of many of the road, rail, and air networks for Southern Ontario and the Greater Toronto Area (GTA). Canada’s road and rail networks are excellent and well planned and Toronto is no exception. Highway 401 runs through the city and is the widest and busiest highway in Canada. Within the city, road layouts in Toronto are in the typical grid/block layout so navigating, once you get the hang of it, is easy. A major rail transportation hub there is much commercial rail freight activity in the Toronto area. Via Rail provides passenger services linking Canadian cities right across the country. Amtrak trains run to New York. There are several bus and coach stations in Toronto serving the city and intercity routes across Canada. Toronto Transit Commission runs a well provisioned system of subways, buses and streetcars which cover 1,200km across the city. A single flat fare applies for any trip across the city excluding just a few outside or express routes. There are eleven streetcar routes in the Toronto Streetcar System making it the largest tramway in North America. Some of the system dates back to the 19th century. You are able to drive in Toronto for 90 days with your UK driving license, after which you must exchange it for a Canadian driving license. You can do this by taking your documentation to a Service Canada location where you can complete the process quickly and be provided with a photographic driving license. Home to the biggest airport in Canada and the world’s 15th busiest airport, Toronto boasts Toronto Pearson International Airport. There is also a smaller commercial airport on Toronto Island and a further International Airport 85km away in neighbouring Hamilton. Toronto has 13 distinctively different and attractive neighbourhoods. A move to Toronto will leave you spoilt for choice of your next home location. From bustling City Centre to historic Old Town, trendy Westside or million-dollar views on the Waterfront and Toronto Islands. You can also choose from Eastside, Don Valley, High Park, Uptown, Scarborough, Mississauga, Brampton and family friendly Etobicoke. 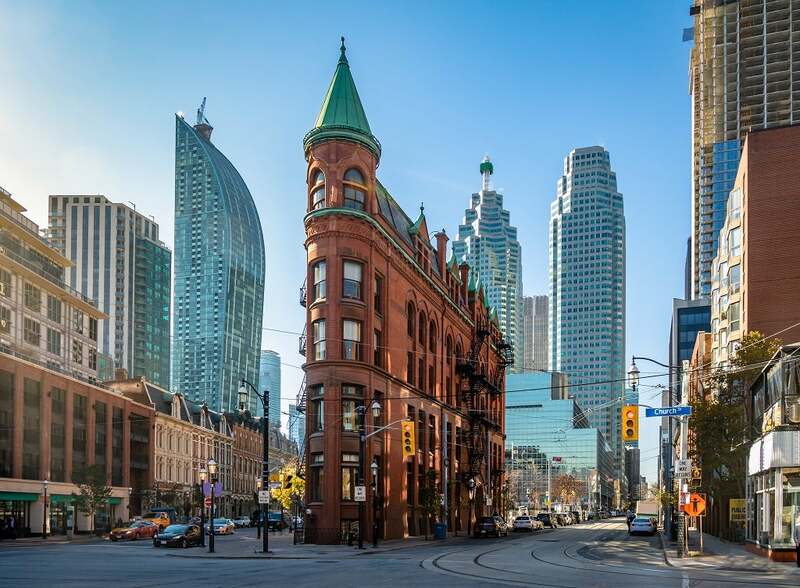 Downtown city centre in Toronto is a mix of commercial and residential properties and is safer when compared with other major North American cities, but is expensive. Outlying commuter towns offer safer, more family friendly options with lower prices. With excellent transport networks in Canada and indeed Toronto, commuting is not something to be fearful of. Music, media and multiculturalism flourish in unique and culture rich Toronto. There are museums, art galleries, theatres and festivals. The Royal Ontario Museum is known around the work and the Art Gallery of Ontario is one of the largest in Canada and America combined. Film and theatre are a backdrop to Toronto’s vibrant cultural base. There are film festivals most months and the Toronto International Film Festival (TIFF) is every September. As well as the film festival in September, the International Festival of Authors falls in October, the Royal Agricultural Winter Fair and Hockey Hall of Fame in November, the Toronto International Boat Show in January, Canadian International Autoshow in February and the Canadian Music Week in May, to name just a few. The holiday season begins with a list of Halloween events, a Santa Claus Parade, the Toronto Christmas Market and ends with a New Year’s Eve celebration in the city. Throughout every year in Toronto the city’s multiculturalism and creativity shines with street and music festivals, there is even a LEGO fan festival! With a strong history in sport including hockey and football. Canada is home to the Toronto Maple Leafs (hockey), Toronto Argonauts (Canadian football league), Toronto Blue Jays (Major League baseball), Toronto FC (Major league soccer) as well as basketball, lacrosse and smaller league soccer. There are also many semi-professional and amateur clubs. If you’re a fan of something less mainstream Toronto has yachting, curling and rowing teams. Toronto hosted the Pan American and Parapan American Games in 2015 but has yet to win an Olympic bid. Sports facilities and opportunities to play or learn in Toronto are excellent and extensive across the city.